My all time favorite movie is Forrest Gump. I can't tell you how many times I have watched that movie, and each time I catch something embedded in the scenes that reaches deep into my soul. Lately I've been thinking about Forrest and his running. Forrest ran as a child to escape the taunting of his classmates. Ironically, that ability to use a skill gained from a not so good situation gave him the college education he otherwise would not have been able to get. His running saved his life during the Vietnam War. Then there was the scene where he "just started running", traveling across the country. Why did he run? 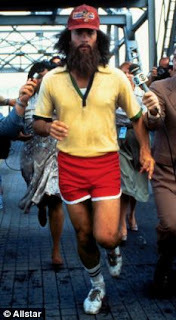 The movie never explains out loud his reasons for running. Maybe it was to escape the pain from Jenny. Maybe it was the way he knew how to let go of the hurt. I've heard runners talk about running to relieve stress and to clear their head. The reason he ran may not be as important as the message of what happened along the way.